Right around July, it can feel like the summer will never end. Yet, before we know it, the Barclays POINT to Bloomberg PORT transition will be here faster than a back to school supply sale at Target. What does that mean for firms who are still struggling with their data migration? First, if your firm hasn’t started anything yet, it’s safe to guess that you will likely miss the deadline. As of July, firms should already have a contract with their new vendor, and should be starting the migra- tion process relatively soon. Next, firms should be finishing up the analysis on up/downstream impacts and in/out of scope items this month in order to stay on target. There are several preventative measures that a firm should take to review the workflow process. 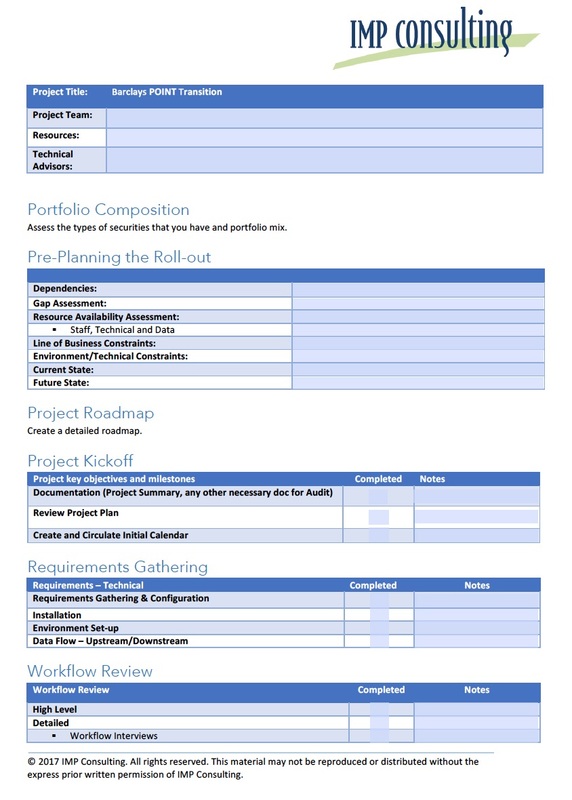 If you are still working through your project timeline, download this quick checklist from IMP to help get your project on track for 2018. Fill out the form below to request the checklist, or Email info@impconsults.com to directly request access. Email IMP at info@impconsults.com for additional guidance on project roadmaps or general questions regarding the POINT to PORT transition. Time is Ticking – July Update! If You're Sticking with PORT - Don't Just Sit There!